Am I a Dependent or Independent Student When Applying through FAFSA? 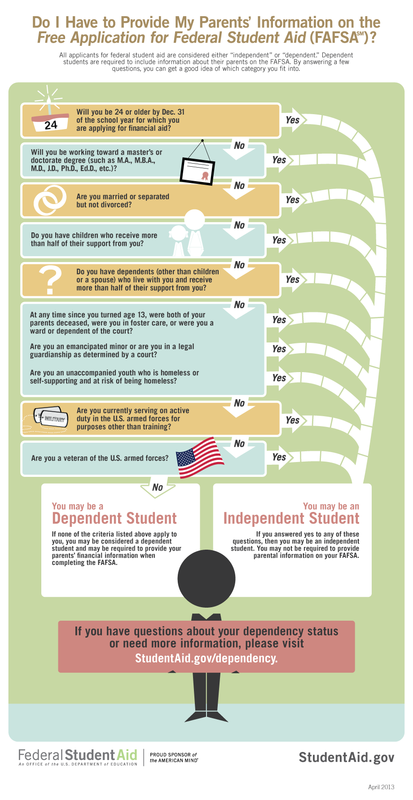 The infographic above may help you know your status when applying for federal student aid. The same information is available here in a downloadable checklist format. Filing the FAFSA is an essential part of seeking scholarships and financial aid for college. Many scholarship programs use FAFSA calculations to determine financial need. Additionally, colleges and universities award federal financial aid dollars based on a first-come, first-served basis, so you want to be sure you are considered for aid you may be eligible to receive. New this year --- the FAFSA can be completed any time after October 1 and most colleges/universities require FAFSA completion by March 1 of the following year. The College Foundation of North Carolina (CFNC) sponsors FAFSA Day across the state. On this date, students and parents/guardians can go to participating financial institutions to get assistance in completing the FAFSA. This year's date is October 28, 2017. To register to attend, click here. Provided by the US Department of Education to help all students access and learn about all types of financial aid. ​This document provides tips specifically for students who are not living with a legal/parent guardian and lack stable housing on completing the FAFSA. Big Future website is sponsored by The College Board and provides solid information about all aspects of college planning, including Financial Aid. An informative website with all types of information about financial aid.